My name is Max Mckenzie and I am 10 years old. When I was 5 years old I was diagnosed with a brain tumour which has left me blind in my left eye. I had 16 months of horrible chemo, blood transfusions, tests, MRIs, and operations followed by a 9 hour life threatening brain surgery to remove the tumour. Since my diagnosis all I have wanted to do is help other children and make them smile. 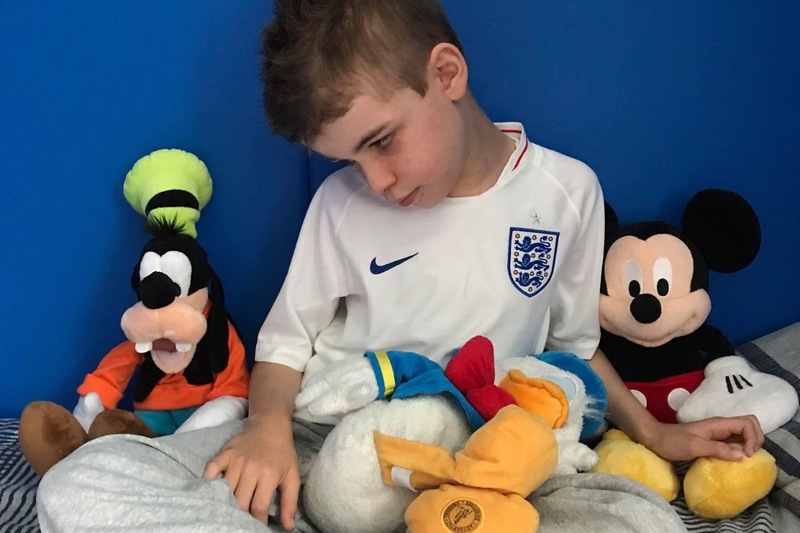 I am wishing to raise money to take Jack to Disneyland Paris. He is the son to one of my mums friends and I think he really deserves a special treat along with his mum and Dad and brother and sister. He loves Donald Duck and Mickey and would love for him to meet them. Jack was diagnosed with Tuberous Sclerosis Complex at 12 weeks old after suffering several episodes which were confirmed as seizures. It’s a rare genetic disorder, that in jacks case happened spontaneously as neither me or mike are affected. 10 babies every month are born with TSC. The effect varies from person to person but Jack is severely affect. Tuberous sclerosis Complex (TSC) causes non cancerous tumours to grow in organs of the body such as brain, skin, kidneys, heart, eyes and lungs. In jacks case his brain and most recently confirmed his kidneys. The tumours in his brain are widespread, cannot be operated on (confirmed at GOSH) and cause his epilepsy and severe learning disabilities. He has daily seizures which vary in type. Some days he has 3-6 seizure and other days at his very worse up to 200. His epilepsy is drug and ketogenic diet resistant. He had a care plan in place and regularly requires rescue med and ambulances. His poor seizure control puts him at risk of sudep. The epilepsy causes weakness in the right side of his body, on good days jack is mobile and can walk. However when seizures are at there worse Jack can barely sit in his special chair, hold head or chew, meaning food is puréed. One tumour in his brain presented differently. Confirmed before he was 2 years old as a Subependymal giant cell Astrocytoma or SEGA. This required regular MRI’s as confirmed growth near fluid canal put him at risk of hydrocephalus. In June 2014 he had most of this removed as had become the size of a medium egg and had become life threatening. He regularly has mri’s to make sure the two remaining pieces too risky to remove are not growing. At present there is no sign of growth but that may change. Jack has a severe learning disability. He functions to that of a 9-18 month old. He requires 24/7 1:1 care, as has very little understanding of world and can do little for himself, we meet all his care needs, with no outside help. He attends the most amazing special school in Linton.